In early May a friend in the Pentagon sent me a photo of a Mac sitting on the hood of a Humvee, with a comment that “Marines use only the best.” A few days later an Apple employee sent me another copy of this picture, plus a second, with a short note that said the photos were taken in Iraq. I now had a mystery: where did these photos come from? Using clues found in the images as a guide, the photos were eventually traced back to Andrew Cutraro, a photographer with the St. Louis Post-Dispatch. Along with Post-Dispatch reporter Ron Harris, Cutraro was sent to cover the war in Iraq. “Embedded,” as the Pentagon phrased it, with Lima Company, 3rd Battalion, 7th Marine Regiment (part of the First Marine Division), Harris and Cutraro crossed into Iraq from Kuwait, and chronicled the war all the way into Baghdad. Their stories and photos appeared in both the paper and on the paper’s Web site, St. Louis Today (http://www.stltoday.com/). St. Louis Post-Dispatch photographer Andrew Cutraro sends photos from Iraq via satellite telephone from his PowerBook G4 while a Marine sleeps on the hood. Note the duct tape covering the headlights, reflectors and turn indicators on the Humvee; the Pentagon was willing to shed light on what was happening in Iraq, but not that kind of light. Through EXIF (Exchangeable Image File Format) data embedded with the image, we can see the photo was taken March 23, 2003 at 11:46 p.m. (according to the timestamp, at least), using a Canon EOS-1D camera with an 18 mm focal length, f9.4 aperture and exposure speed of 1/279th of a second; the original photo is 2464 x 1504 pixels. (Photo by U.S Marine Corps). Much has been made of how “embedding” allowed the press to cover the war in a more immediate and personal way. In contrast, not much as been mentioned about the technology used by the press, and that first picture captured the story quite well. Perched on the hood of a Humvee (HMMWV, or “High Mobility Multipurpose Wheeled Vehicle”) was a PowerBook G4, hooked to a satellite phone, with a Marine at the keyboard. As it turned out, it wasn’t a Marine, but Cutraro, busy sending photos back to the St. Louis Post-Dispatch by satellite telephone. If you look closely, you’ll see that not only is the Humvee a convenient bed for a sleeping Marine, it is also the power source for the satellite telephone. The Marines supplied the transportation, the food, the helmets and flak jackets, the camouflage uniforms, goggles and gloves (not to mention a heavily armed company for protection in a dangerous environment); Cutraro supplied his PowerBook G4, his Canon EOS-1D digital camera, and his satellite telephone. 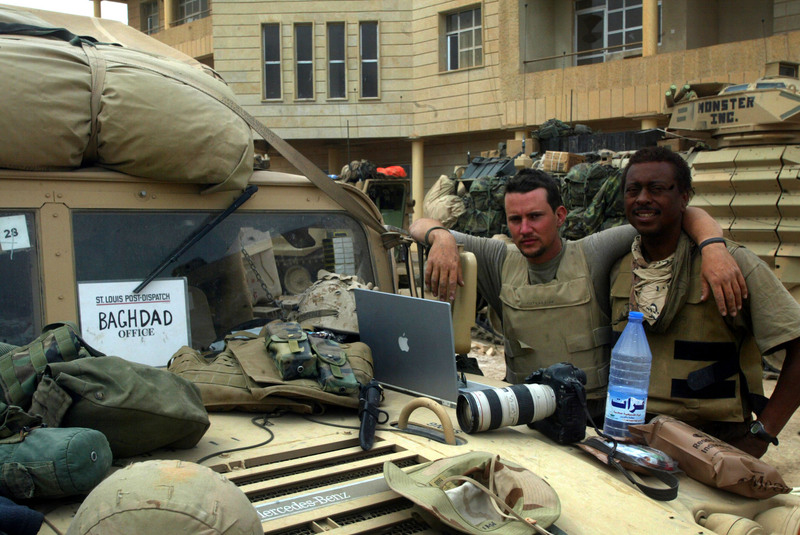 From the middle of a battlefield in a desert on the other side of the planet, the PowerBook G4 allowed him to transmit photos directly to the newspaper – without going through a military censor. Cutraro passed on a note he wrote to Vin Capone, who works in digital video and QuickTime development for Apple. 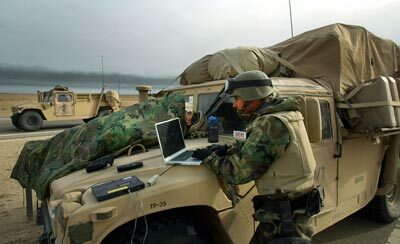 Just a note to say how [colorfully expressed] well your G-4 performed on my journey into Baghdad with the 7th Marines. I've never been in such grueling conditions. I had no expectation of any gear surviving the trip: thirty one days in blinding sandstorms, swamps and firefights. My reporter's Dell didn't make it home in one piece. And here I am sitting in St. Louis typing email at a coffee shop on the same machine. The screen has some potmarks on it, and the titanium finish is a little worn, but it's still running. I never even shut it down, just slept it. Flawless! When the shooting died down, Marines would gather in the back of a Humvee and we'd watch DVDs. So, I have to say, you'll have some MAC converts in the Corps when they return. Attached are some photos of your machine in [a colorful and descriptive phrase]. I only wish my body could stand up to the conditions in the same manner. Thirty one days without a shower does funky things to the human body. Take care and Semper Fi. Cutraro returned home to St. Louis in mid-April to shower and take a much-needed vacation. Eventually, he attacked a “flood” of mail and E-mail that “overflowed” his desk, and found my message asking about his pictures. In a nice bit of irony, both these pictures – which nicely document how the war was covered with minimal military oversight – were taken by Marines.